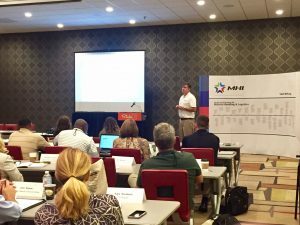 The 9th annual MHI Career and Technical Educators Summit occurred July 10-15, 2017 in Charlotte, NC, with a record attendance of 37 attendees from 14 different states. 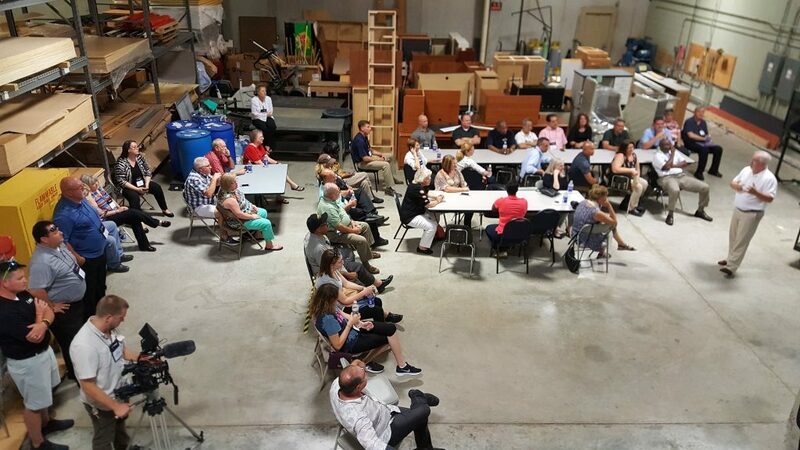 Attendees included instructors and program directors from high schools, technical schools, and community colleges in the area of material handling, logistics and supply chain. 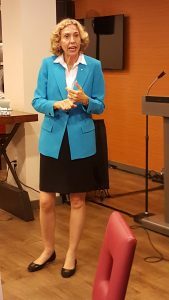 This year’s summit theme was “Building the Workforce of Today and Tomorrow”. Educators learned valuable instructional material, teaching techniques and acquired important partnerships to take back to the classroom. Here are highlights from this five-day event. MHI CEO, George Prest and Angela Jenkins, Career and Technical Education Director welcomed attendees and introduced them to MHI’s robust Career and Technical Education Program. 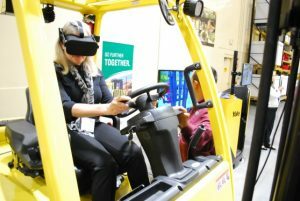 Pat Davison, Director of Standards and Education at MHI asked, what will material handling jobs look like in year 2030? He explained how the U.S. Roadmap for Material Handling & Logistics: Version 2.0 helps paint this picture. 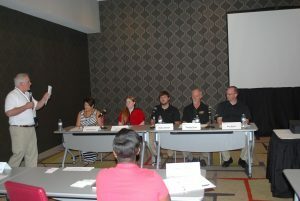 The Rock Hill School District highlighted the Logistics Career and Technical Education (CTE) program with a work-based learning panel, presentation, and facility tour. The Rock Hill Applied Technology Center (ATC) is the flagship program for the MHI CTE Program, founded by MHI Board Member and Former CEO of Frazier Racking, Don Frazier. Dr. Bill Cook, Executive Director of Secondary Education for Rock Hill School District, welcomed the participants to the summit and Rock Hill ATC Session. The MHI Career & Technical Education program began at the Rock Hill Applied Technology Center approximately 10 years ago. Summit attendees had the opportunity to learn about this material handling, logistics and supply chain high school program through a facility tour. Central Piedmont Community College hosted the attendees Wednesday morning, at the main campus in Uptown Charlotte, NC. Chris Paynter, CPCC Dean of STEM and Loretta Evivie, CPCC Division Director of Business & Accounting, presented two career pathway opportunities. Chris Paynter’s Mechatronics Engineering Technology program provided curriculum content and tour of detail of their state-of-the-art learning lab. Steve Harrington, Industry Liaison of National Center for Supply Chain Automation provided details of industry demand and current collaborations across the country. Thursday was designated for Education Resources and Academic Partnerships. The day began with a state-of-the-art facility tour of Target Distribution Center, Newton, NC hosted by Stephen Sims, Engineering and Plant Operations Manager. 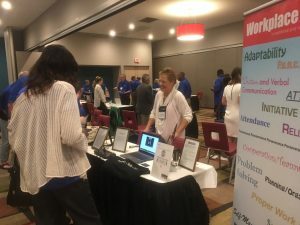 The attendees spent Thursday afternoon speed networking with organizations that provide products, services and other resources that could build and enhance their programs. The attendees enjoyed dinner and entertainment at the Charlotte Knights AAA Baseball game. 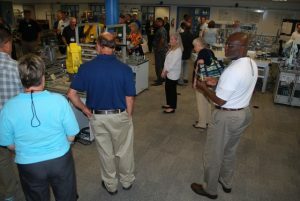 The final day of the summit was at the Hyster-Yale Experience Center in Charlotte, NC. Jim Bladel, HY Manager of Technical Training Development & Delivery along with Danielle Coufal, HY Training Coordinator provided a tour of the experience museum and hands-on experience with trainers in the demonstration center. Mark your calendars for next year’s Career and Technical Educators Summit, July 9-13 hosted by Vincennes University, Indianapolis, IN. Contact Angela Jenkins, MHI Career and Technical Education Director at ajenkins@mhi.org for more information.